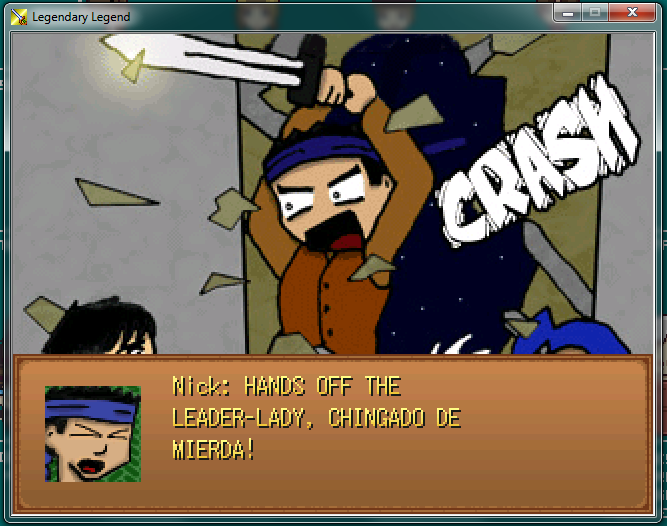 Legendary Legend is a game that's sparked a lot of debate over at RMN (RPGMaker.net) recently because it's currently their featured game. The reason for all the attention (aside from it being featured, of course) is that it's one of those games that purposefully labels itself as "comedic", resulting in arguments that revolve around the extent to which "comedy" and "writing" can make up for "gameplay". Of course, this instantly implies that people don't really rate the gameplay in this game, because if people did rate it then there wouldn't be any need to ask if "comedy" and "writing" can make up for it because it wouldn't need making up for! Unfortunately, I have to agree with this sentiment as the gameplay in Legendary Legend is physically painful. First of all, you have the battles; they are far too easy, the enemies have far too much HP and there is no strategy involved whatsoever. This is a bad combination because it means that every single battle is a space-mashing fest that the player has no choice but to suffer through. This sheer lack of entertainment is compounded by the fact that the battles take far too long to finish. I know this is true because I actually timed one of my battles and I found that, for one of the characters, it takes a full forty (40!!) seconds for their ATB meter to fill up. If you consider that it takes around 4-5 hits to kill a typical enemy in this game and then consider that there are usually 3 or more enemies present in a single battle then you'll probably see why this is a problem. If a game has boring battles and then insists on dragging them out for incredibly long amounts of time then it is just being silly; this isn't fun and if you happen think it is then do me a favour and go play Desert Bus. And... there aren't any more problems with the gameplay, but that's only because there isn't anything else to the gameplay. That's your whole lot and, as far as I am concerned, no amount of good writing can make up for this kind of garbage. To end the review here, however, would be incredibly unfair because I'd be leaving more than half the game untouched. You could argue that it's pointless for me to continue because it's already obvious that the gameplay alone is enough for me to abhor this game (spoiler: the rating is 0/10), but I'm going to struggle on regardless because I want to talk about the so-called "saving grace" of this game: The writing. As I've already made obvious, I'm not of the opinion that even the finest writing could make up for the gameplay in this game. However, a lot of people have talked up the writing and the comedy as something that makes the rest of the game worth "playing" through (playing is so the wrong word). Of course, this only gives me more impetuous to point out that the writing in this game is, in fact, terrible. The funniest thing about this game is that it was featured, but that's also the saddest thing about this game. Whoever made that decision should be ashamed of themselves and I mean that in the most sincere way possible. 0/10. 0/10 - you've sold out! Admit it, it's a -1 at best. How about reviewing some of Yahtzee's games? I take it that you have never played Destiny's Call Complete? That is truly a tasteless RPGMaker game. come at me bro is starting to piss me off. read the posts at least you lazy bot- i mean idiot. anyways. thanks for the post. sorry for the personal attack. loll u made me want to get this. I sincerely do not feel ashamed for featuring it.